And what better way than to jumpstart the week with a swim class at New York Sports Club? For this splashy adventure, Kate braved the water, supplied with noodles and kickboards, and took our swimmers through fun lessons. In between dips in the pool, the children relaxed under a warm water spray in the poolside shower. While the cast of the musical rehearsed on Tuesday with Julietta and Maysaa, Poppy set up the upstairs as a CD case decorating studio and Takota, Hinako, Yoko, and Bodi used liquid watercolors to adorn CD covers for the original cast recording of “When Times Get Tough.” We had more covers to decorate on Thursday, so we brought out the watercolors again. Thank you to Lila for her inspired idea to emboss the covers with handprint art! This project is a wonderful example of how everyone around Pono works together toward a common goal. Dr. A came for a visit and put on her veterinary hat. With spring break on the horizon, she got the animals in tip-top shape with the help of the smaller children. Together they cleaned cages, fed and watered Brian Greene, the turtles and the many (many!) new gerbils. 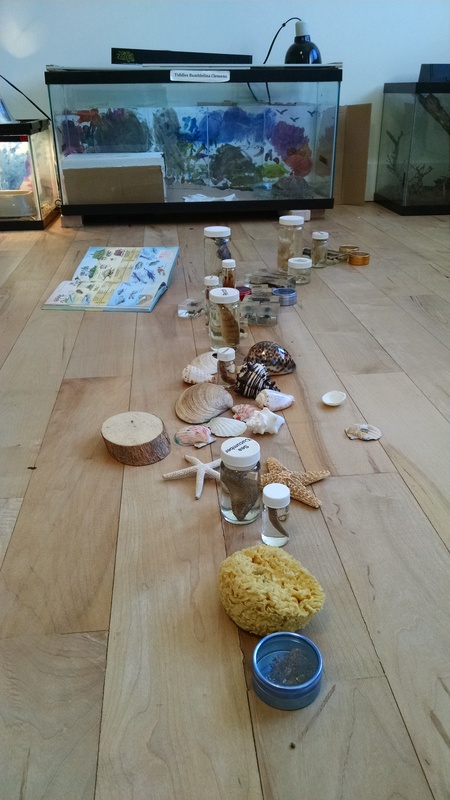 She also brought back her jars of animals as well as a handful of mollusks and sea stars. Evan particularly enjoyed studying the starfish. On Thursday afternoon Mufeeda led one more Pono cooking class. She finished her internship with us at the end of this week, and we are grateful for all of the delicious, healthy, and creative recipes she shared with us. We will miss her! For this lesson, Mufeeda asked Jasper to read aloud a recipe for banana bread and invited him, Evan, Bodi, Lila, and Takota to measure, pour, and mix ingredients. As the bread baked, Zoë took a break from rehearsing because she said she “wanted to follow her nose” to find the delicious smell coming from the Pono kitchen. The children have been requesting a visit to a glass-blowing demonstration for some time, and thanks to our winter Gift Catalog fundraiser, we could finally make this trip happen! On Wednesday we trekked to Fort Greene, Brooklyn, to visit Urban Glass, a facility that boasts 17,000 square feet of studio space. Our guide Helena greeted us enthusiastically and gave us a tour of the gift shop, where we admired examples of glass art in a variety of colorful forms, including bricks, puzzle pieces, and even Legos. Then it was upstairs to the spacious studio where we met glass artist Moshe Bursuker. We all donned our safety goggles and watched as Moshe created a beautiful aqua-colored glass pitcher. He explained each step of the process and took time to answer all of our questions. Moshe and his assistant Rob worked quickly and skillfully to dip the glass at the far end of the blowpipe into the 2000-degree glory hole, take it out and shape it with many interesting tools, including wet newspaper! We watched admiringly as the artists moved through the studio space with great virtuosity and ease, quite a feat considering the delicate nature of their creations. We finished off the day with a lovely lunch in Fort Greene Park, where the children forded “rivers” of melting snow from the recent springtime thaw. Congratulations to the cast and directors of “When Times Get Tough” on their spectacular production on Saturday afternoon! After countless hours of perspiration, the Pono players soared! Sulaf, Zoë and Roly dazzled their audience with their heartfelt performances. Towa supported his friends by contributing his wonderful eye for direction and Julietta artfully guided the musical to its fantastic conclusion. The detailed set design by Poppy transported the audience. And what would a musical be without music?! Kuni composed and performed the beautiful, catchy score for “When Times Get Tough.” More than one Pono friend has been humming the melodies to the show’s numbers! To the many people who attended the performance, and to those who supported this endeavor by donating their time and talents, we extend a heartfelt thank you. This experience will go down in the Pono archive as one of great achievement.